Leadville offers more than history and heritage. It’s a small town where a wide range of outdoor recreational opportunities exist. Bicycle races, fishing, and hiking dominate the summer months while regular and cross country skiing are strong sports during the winter. The town’s Mt. Massive nine-hole golf course, the highest one in the nation, provides full facilities and reasonable rates. Golf has been played at the site since the 1930's which now caters to 20,000 rounds annually. At the golf shop, you can rent balls and clubs, shop for golf apparel, or obtain lessons. The Mt. Elbert Grill is located on the premises. The season runs mid May to mid October. Regular walking rates are $22 for nine holes and $40 for 18 holes from 9:00 a.m. to 3:00 p.m. The riding rates are $29 for nine holes and $54 for 18 holes for the same hours. The course offers discounts before 9:00 a.m. and after 3:00 p.m.
You’ll find Mt. Massive Golf Course, three miles from Leadville, at 259 County Road 5. The phone number is (719) 486-2176. 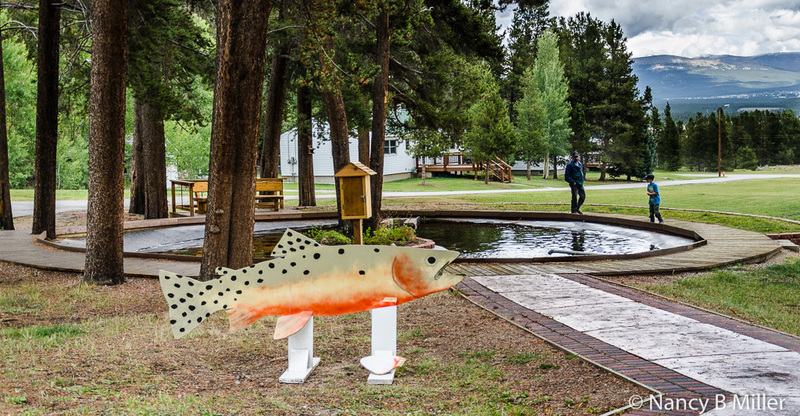 The Leadville National Fish Hatchery, established in 1889 by Congress under President Benjamin Harrison, is the second oldest federally operated fish hatchery in the United States. It was placed on the National Register of Historic Places in the 1970's. Congress chose this site for its cold, clean water supply from Rock Creek and its nearby sources of native cutthroat trout. It’s one of 70 managed by the U.S. Fish and Wildlife Service whose original purpose was to replace fish populations lost due to over fishing or habitat degradation. Since the early days, the hatchery has provided seed stock of several species to established other trout hatcheries in many states. Currently, it also supplies, annually, between 125,000 and 200,000 adult trout (cutthroat and rainbow) to waters throughout Colorado. Found south of Leadville, the public has free access to tour the hatchery’s facilities, picnic at its site, or hike several trails. You should plan on spending a minimum of a half hour here to see the facilities, more if you plan to take advantage of the other recreation. You’ll notice the 16 raceways as you drive into the site. These are used to raise fish to a size big enough for restocking. Fish food is available at dispensers near these raceways as well as the pond outside the main hatchery building. At the display pond, you’re supposed to spot adult examples of cutthroat and rainbow trout. I was disappointed when I looked in the pond and didn’t see any swimming around. But maybe I just missed them or, perhaps, it was the time of year, as by September many of the fish are gone. 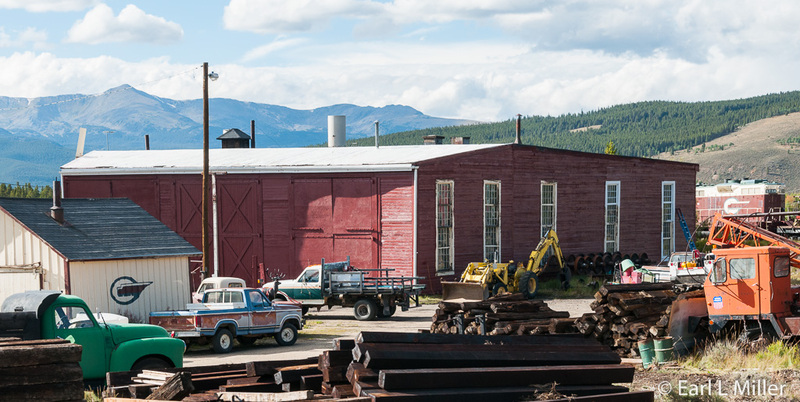 Constructed in 1890, Leadville’s main hatchery building is composed of native red sandstone. In addition to 20 nursery tanks, it contains exhibits on what the original fish hatchery was like and how it operated in the 1890's compared to now. Take time to explore the displays and observe the hatching/rearing tanks in the building. I saw some were being used; others were empty. But upon looking carefully, I spotted a couple of fish. In 1891, fishermen netted brook, brown, rainbow and cutthroat trout from Colorado, New Mexico, and Yellowstone National Park. They were spawned and the eggs shipped to Leadville for incubation. By hand, employees removed dead eggs and those with fungus. At first, fish food was made from scratch with the workers making the food themselves. Smaller fish ate fresh ground liver. Larger fish fed on a mixture of meat and grain. The feed was kept cool year round. Ice was harvested in the winter then stored in the summer. 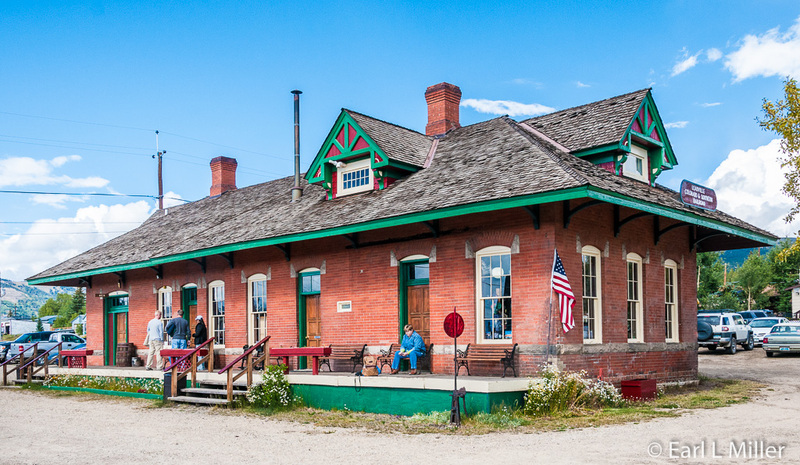 During these early days, the hatchery transported many of the catchable-sized fish to Leadville’s train depot, where they were loaded on to rail cars specifically designed to carry them and their human attendants. These attendants stirred the water with slotted spoons so the fish could get enough oxygen. The use of these railroad fish cars ceased in the 1940's. At their final destination, workers then transported the fish in milk cans on pack horses, pack mules, or horse drawn wagons. The jostling of cans over the rough terrain aerated the water. The first batch of hatch-raised trout was in 1891 with the fish sent to lakes and streams in Colorado, South Dakota, and Nebraska. Today, the Leadville National Hatchery receives eggs and fingerlings (fish up to six inches long) from mature breeding fish maintained at other hatcheries. When female trout are “ripe”, employees gently squeeze their abdomens and the eggs fall out. Fish can yield up to 5,000 eggs. Male fish are lightly squeezed for milt, the liquid containing sperm. By hand, employees mix the eggs with the milt to promote fertilization. The babies hatch within two weeks and have eyes and a yolk sac. The sac is their food for up to two weeks, then the babies, known as fry, swim to the high protein fish food. It’s made from fish meal, vegetable meal, brewer’s yeast, and other nutrients. They grow almost a half an inch a month in water that ranges from 34 to 55 degrees. As they grow, the food amount increases from fine grains to pellets that are 3/8th of an inch. The fingerlings live in the race tanks. At ten inches, they are netted by hand and put in tank trucks, from June through September. Each truck, equipped with aerators, carries one or more 500 gallon tanks loaded with 2,200 catchable size trout to stocking sites. Sometimes they use helicopters. In recent years, these hatcheries have expanded their roles to help restore native fish to their original habitats. You’ll also see a billboard about the green cutthroat trout. These were believed extinct in 1937. But in 1973, a small population was found in Rocky Mountain National Park so they were put on the endangered list. Since 1978, due to their increasing number, they are now on the threatened list. 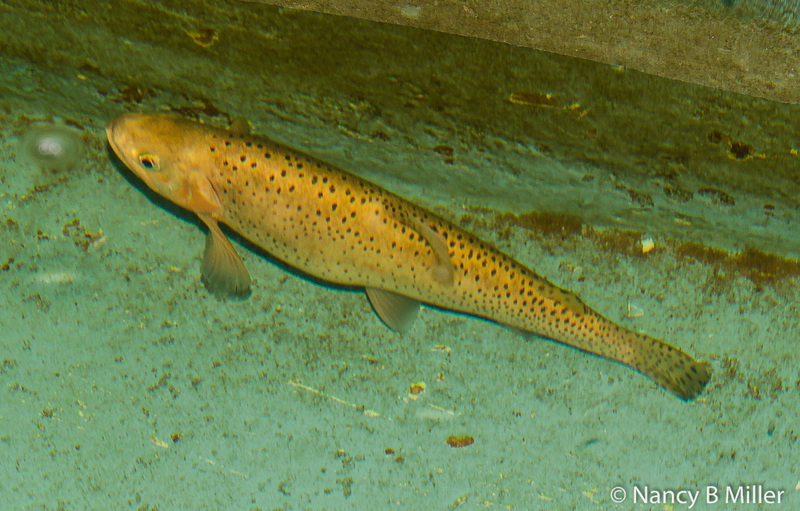 Leadville National Hatchery maintains broodstocks of this trout, producing eggs and fish, to aid in the recovery efforts for this species. The Evergreen Lakes Nature Trail is a one-mile loop trail located near the raceways. It has interpretative panels describing the wildlife, plants, and the Evergreen Lakes Hotel historic site. This former hotel burned to the ground January 19, 1884. J.J. and Molly Brown had breakfast there. Three longer trails are also available: the Rock Creek, Highline, and Kearney Park. These connect to the Colorado Trail in the Mt. Massive Wilderness Area. 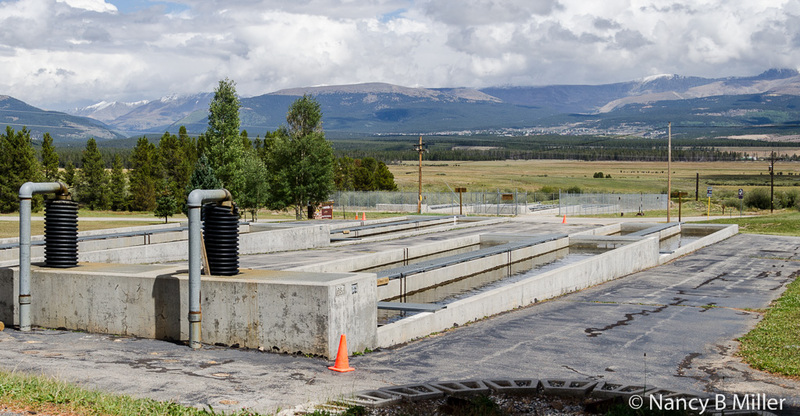 The Leadville National Fish Hatchery is located at 1846 Highway 300. The telephone number is (719) 486-0189. The grounds are available 24-7 and the main building is open 7:00 a.m. to 3:30 p.m. daily. Admission is free. One not to be missed attraction in Leadville is a train trip on the Leadville Colorado & Southern. The ride follows Route 91 as it traverses 1,000 feet above the headwaters of the Arkansas River Valley. You’ll pass the Aspens and pines of the San Isabel National Forest, meadows covered with wildflowers, and numerous mountain peaks. It ends up near the Climax Molybdenum Mine. 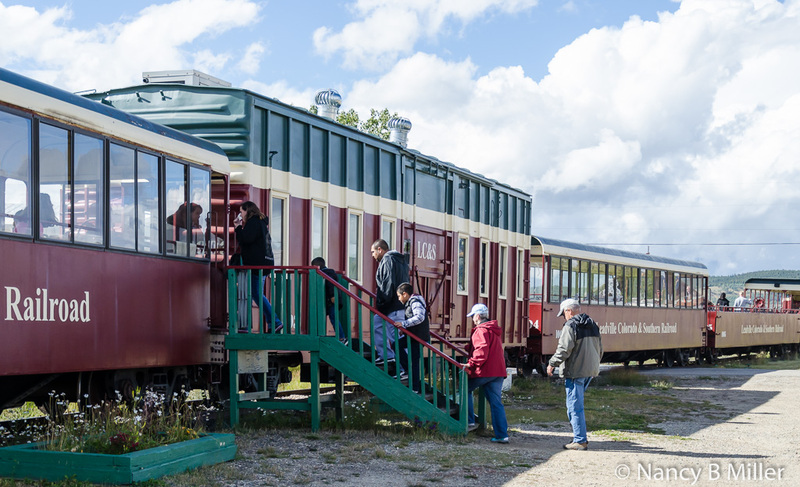 Throughout your outgoing journey, a conductor provides excellent narration on what you are seeing, as well as the area’s railroad and mining history. The locomotive is a 1955 diesel with 1,750 horsepower made by General Motors. Cars are open and closed. Compared to many trains where seating is assigned, you have complete access to any car. 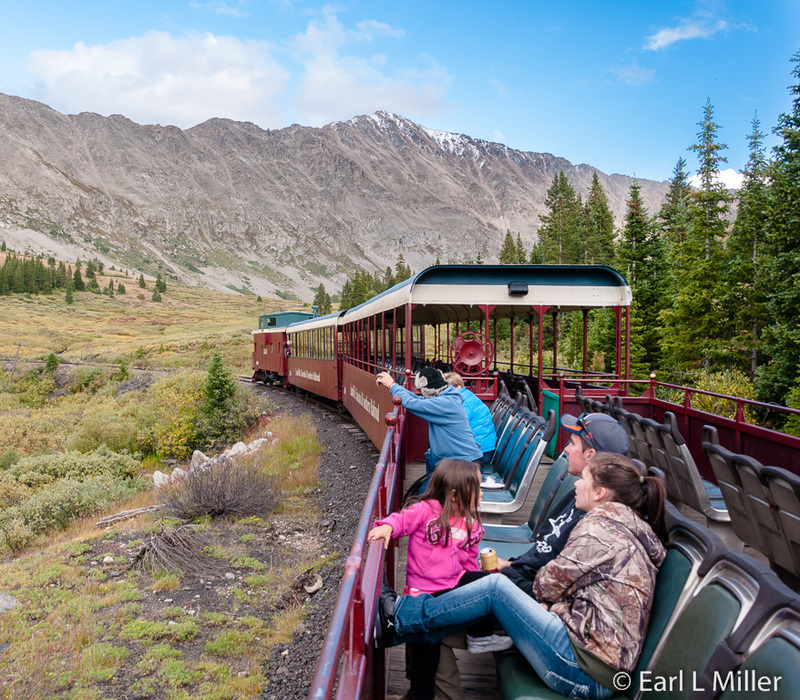 Also appreciated is that although some trains, like the one at the Royal Gorge, don’t have seating in their open cars, the open cars on Leadville’s train do. Dog lovers will appreciate that they allow well-behaved pets. The only level areas of your trip are at the start and end. You’ll travel at five to ten miles per hour and go up grades 1.6 to 2 percent. Eventually, you’ll raise 1,000 feet in elevation above Route 91. First, you’ll pass the Sawatch Mountain Range to the west of Leadville. It’s dominated by Mt. Elbert at 14,440 feet and Mt. Massive at 14,421 feet. These are the two tallest mountains in Colorado. On the other side is the Mosquito Range with Mt. Shannon and Leadville’s Old Mining District. Upon entering the forest, you’ll find lodgepole pines predominate. These were logged for buildings and mine timbers. They were also a source of charcoal in the smelters. In the 1870's and 1880's fires occurred in this forest. Now lodgepole pines are being destroyed by Bark Mountain Pine Beetles. The trees you’ll see are all second growth. We learned that the area’s Aspen trees are in groups called clones. They reproduce laterally sending their shoots up. All the Aspen trees in the area are related. You’ll also see Englemann Spruce, Colorado Blue Spruce, and Junipers. You’ll see a foundation for the former Three Mile water tank that was originally built in 1884. It was a 50-gallon tank fed by gravity from a spring above the track. It was usually the first water stop for eastbound freight trains. The tank was removed in 1968. After making a 180-degree turn, you pass part of the Mosquito Range with several 13,000 foot peaks. Your conductor will point out the former site of Howland Mining Camp. The camp had 100 residents and existed between August 1879 and September 1882. If you look across, you’ll see old Denver and Rio Grande track at the bottom of the valley. It crossed the valley right at the Prospect Mine. The normal turn around stop for this railroad is Fremont Pass near the Climax Molybydum Company. Charles Senter staked the claim for moly on Bartlett Mountain in 1879. In 1895, it was identified as moly by a professor at the Colorado School of Mines. Senter sold the claim for $30,000. In the 1950's and 1960's, moly was worth $17 a pound but by the 1980's dipped to $3 a pound. On your return, you’ll have a 15-minute stop at the French Gulch Water Tank, where you can get off and explore the engine and caboose. But, mostly, on your return, you are left alone to enjoy the scenery without any interruption. The Colorado and Southern Railroad Company (C&S) has quite a history. Its narrow gauge lines were formed in 1898 from the Denver, South Park, and Pacific Railroad and Colorado Central Railroad. Although it had four distinct routes, including the Highline between Como and Leadville, it never owned a new engine. All of its locomotives came from former companies. It operated independently from 1898 to 1908 then became part of the Chicago, Burlington and Quincy Railroad. Between 1910 and 1943, the railroad slowly lost pieces of track. Some rails were torn up with others sold to the Denver & Rio Grande Western Railroad. In the summer of 1938, removal came for all but 14 miles of the former Denver, South Park & Pacific which ran between Denver and Leadville. That was the segment between Leadville and Climax now used by Leadville Colorado and Southern Railroad. 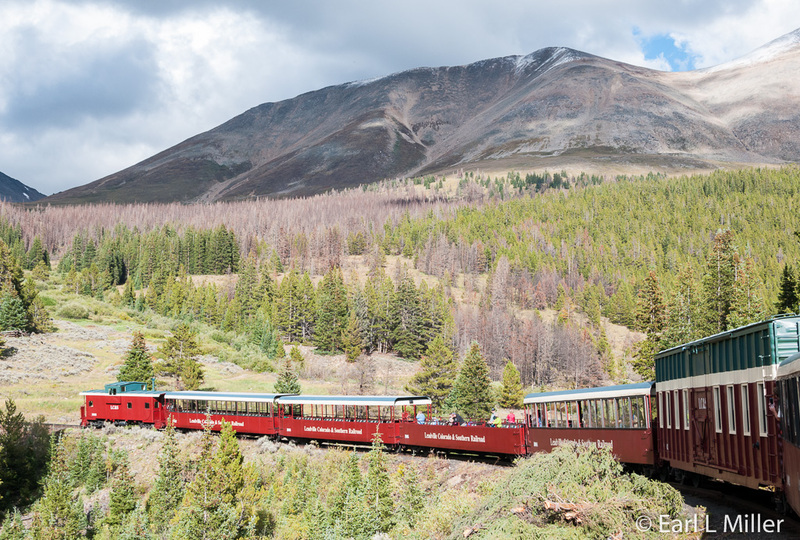 The last C&S narrow gauge train, pulled by engine 76, ran the 28-mile round-trip, between Leadville and the Climax Mine, on August 25, 1943. Standard gauge trains started hauling the load the next day. The conversion occurred due to standard gauge rails having heavy traffic during World War II. Since Moly is used in strengthening steel, it’s obvious why this portion of the railroad was kept and maintained. In 1981, it was absorbed into the Burlington Northern Railroad. That company used the rail line to haul ore down and supplies up between Leadville and Climax. In my October 25 article covering the Colorado Railroad Museum, I have a photo of the Denver, Leadville and Gunnison 191. It’s one of five surviving C&S locomotives. Another is also at that museum while the other three are at Idaho Springs, Breckenridge, and Central City, Colorado. Two roundhouses survived and you will pass one of them on your railroad trip. It’s an eight-stall building erected in 1883 that was shared by the Denver and Rio Grande Western and the Denver, South Park & Pacific. The other is in Como, Colorado. Rolling stock has been scattered across the country. 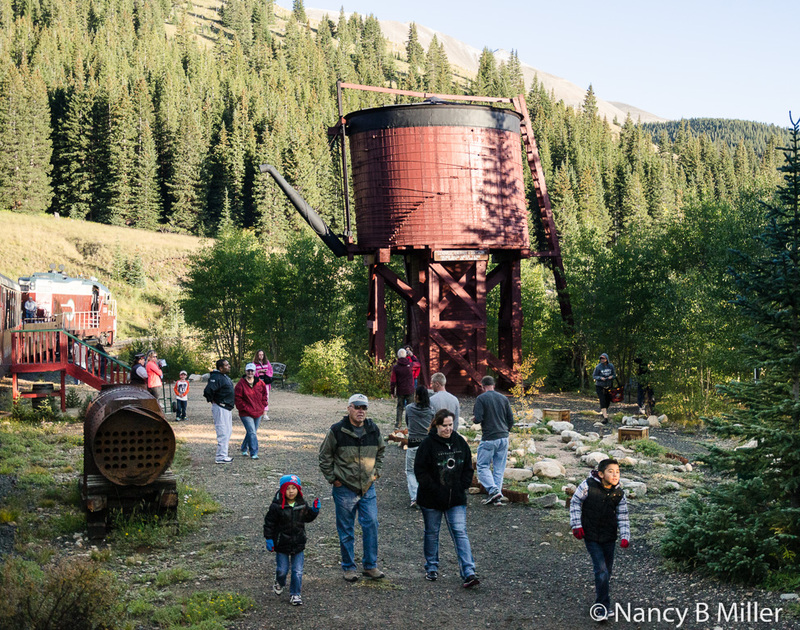 Besides the French Gulch tank, the only other surviving water towers are Bankers tank near Breckenridge and Halfway tank near the Alpine Tunnel east of Pitkin, Colorado. You’ll pass the French Gulch water tank at milepost 142.3. It holds 47,500 gallons. It sat on the opposite side of the track in 1943, but it was moved and raised so the spout could fit standard gauge engine tenders. In December 1987, a Leadville family, Ken and Stephanie Olsen purchased for $10 from Burlington Northern 11-1/2 miles of track, two locomotives, eight flat beds, four boxcars, and five cabooses. It took the Olsens five months to construct the cars in which people now ride. They officially opened their railroad on Memorial Day 1988. The train ride we took was their Stork Curve-Climax and BBQ Special. It was a 3-1/2 hour journey, instead of the normal two hour train trip,which included dinner. The normal route is 11 miles each way while ours was 14-1/2 miles. First, they served a variety of appetizers. Next was a buffet with barbecue pork, sausage, hot dogs, and barbecue brisket along with cole slaw and baked beans. For dessert, they offered brownies, cookies, and cream puffs to go with the lemonade and hot chocolate. Later in the trip, the conductor, Diana, came around the cars, carrying a basket full of desserts, and offering seconds. The train does have a concession car operating on its daily 2 to 2-1/2 hour trips. You can purchase hot dogs, hot and cold beverages, soups, and snacks. You are allowed to bring your own picnic lunch aboard the train. An extra treat for us was the people we met on the train. Ken and Stephanie have turned over the operation to their son, Derek, who is the engineer; their daughter, Kirstin Ayers, who handles the business end; and Kirstin’s husband, Steve, who is Derek’s right-hand man. We had a long conversation with Kirstin and Steve as well as Steve’s parents. I was impressed with their business philosophy - offer quality, reasonably priced trips that families can afford. 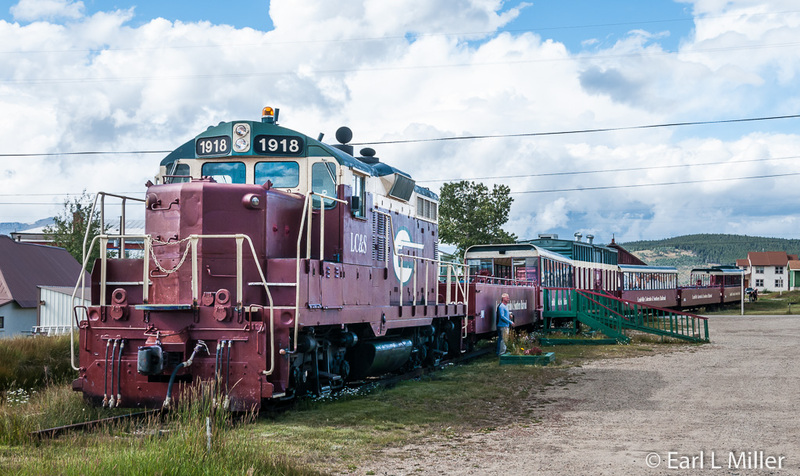 You can catch the Leadville Railroad daily from May 23 to October 4 in 2015. From May 23-June 12, departures are at 1:00 p.m. From June 13 through August 16, the train leaves at 10:00 a.m. and 2:00 p.m. On weekdays, from August 17 through Oct 4, it leaves at 1:00 p.m. and on weekends at 10:00 a.m. and 2:00 p.m. Cost is $37 for adults and $20 for children. Engine and caboose seats are available. You travel one way in them and in general seating in the other direction. There is an additional cost for these. The train is handicapped accessible with plenty of room to move around. A restroom exists on board. Several packages are also available. These involve a combination with rafting or a zip line; BBQ special, and Wild Flower Special including a guided 20-minute hike. Photo Specials, at the normal train rates, take place on three weekends during September. For more information on all of these, visit their web site at http://www.leadville-train.com/special-tours. Their address is 326 East 7th Street in Leadville. Their phone number is (866) 386-3936.